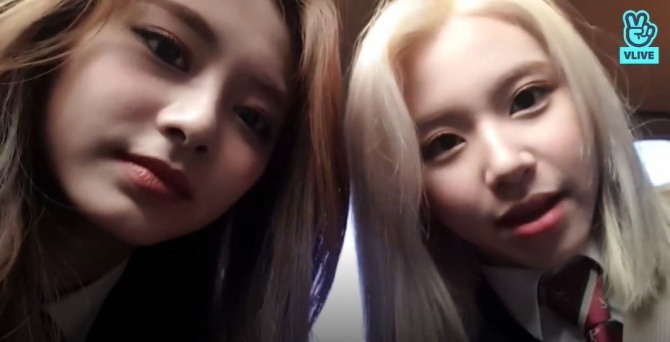 Tzuyu and Chaeyoung of Twice went on V Live on Tuesday morning, letting fans know they were on their way to Hanlim Multi Art School for their high school graduation. “The school is giving us best role model prizes for being diligent,” added a smiling Tzuyu. They talked about their first year of high school, when everything was new, but said it was comforting to see familiar students at school who were also JYP trainees back then. Also, they praised the understanding and caring teachers at Hanlim Multi Art School. At the end, they admitted they felt awkward about being adults, saying that turning to 20 brought up inexplicable feelings. They promised to work harder to be good role models for younger K-pop artists. “Congratulations on your graduation,” another fan wrote. Watch the video at https://www.vlive.tv/video/112728.